The path to great oral health and an unforgettable smile starts with regular dental care and maintenance. Dr. Vanderbrook recommends thorough checkups and dental hygiene appointments. At your checkup, we’ll update your records, discuss immediate concerns, and answer your questions about your oral health. Dr. Vanderbrook has invested in digital X-rays and intraoral cameras for detailed images that aid in accurate diagnostics. 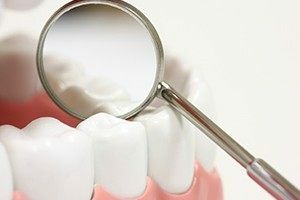 Our team will perform an oral cancer screening and assess your jaw joints and occlusion (how upper and lower teeth fit together), as well the health of each tooth in your mouth. If you suffer with chronic head or neck pain, teeth grinding, snoring, or sleep apnea, please tell us during your visit. Dr. Vanderbrook will explain his findings and discuss treatment options to maximize your potential for long-term oral health. During your checkup, you’ll meet with our hygienist for a comprehensive periodontal (gum) exam, charting, and teeth cleaning. The hygienist can answer questions about your oral homecare routine. 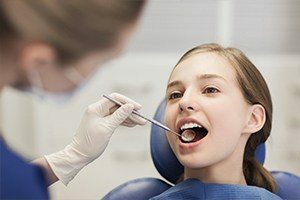 If you show a proclivity for or currently have gum disease, she’ll address the condition by providing options for conservative, yet effective therapy. Contact us today to schedule a visit! Even patients who brush and floss diligently can end up with dental problems that need professional attention. That’s why scheduling regular checkups and cleanings at least twice a year is so important. Our team’s goal during these visits is to form a comprehensive understanding of your oral health and address any concerns that need further attention. We will also get rid of harmful plaque and tartar build-up during your professional cleaning for a polished, refreshed smile. Do your gums seem swollen or redder than usual? Is there blood in your saliva after brushing and flossing? These symptoms shouldn’t just be brushed aside. They may be the cause of gum disease, a gradual infection that can grow to threaten your healthy teeth and jawbone. Our practice will keep a close eye on your periodontal health during checkups and provide therapy when needed to prevent damage. Your premolars and molars (the back teeth) have deep pits and grooves along their chewing surfaces. Unfortunately, this means that food particles and cavity-causing bacteria can easily find their way in. This is especially dangerous for children, who may still be learning how to brush and floss and aren’t able to effectively reach these areas of the mouth. Dental sealants are a simple and effective preventive measure that can keep these teeth safe from harm. It’s important to protect your smile just like you would your head, knees, and elbows when playing sports. Athletic injuries make up a significant portion of dental emergencies, after all. 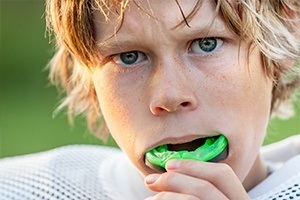 Here in Dallas, our team is happy to provide custom-made mouthguards that are big step up from the “one-size-fits-all” appliances you’d find at the store. They feel comfortable when worn, stay sturdily in place throughout use, and are flexible enough to allow the wearer to speak. Bruxism (more commonly known as teeth grinding) is a widespread condition that negatively affects patients of all ages. Most people will only experience it while sleeping, which means they’ll wake up again and again with painful headaches, jaw discomfort, and worn-down teeth that have no clear cause. Dr. Vanderbrook may recommend facial stretches or the use of a custom-made oral appliance to correct the problem. Here’s a sobering statistic – nearly 50% of patients who are diagnosed with oral cancer this year won’t be alive in five more years. This happens because so many cases aren’t properly diagnosed until they’ve already reached destructive stages. Our team takes this threat to your wellbeing seriously, which is why oral cancer screenings are an essential part of checkups. Dr. Vanderbrook will take a close look at the oral tissue and raise the alarm if any concerning abnormalities are spotted. Fluoride is a mineral that’s often found in municipal water supplies, oral hygiene products, and even certain foods. This is a good thing, though – research has demonstrated a link between regular fluoride exposure and stronger, healthier smiles that are less prone to cavities. 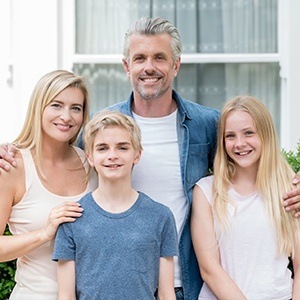 If you and your family aren’t receiving enough of this important exposure (maybe you prefer bottled water), professional fluoride gels and varnishes are available at our dental practice as a backup. When you or a loved one experiences a dental emergency, our team understands how important is to be seen NOW, not in another week or two. That’s why we do our best to make time for patients in need as soon as we possibly can – if not on the same day, then the day after. Dr. Vanderbrook will relieve your pain, provide any necessary restorative care, and help your smile get back on the right track. We love children. Our team recommends that you bring your son or daughter in for a complimentary Happy Visit around the age of one or two. This appointment will include a tour of the office, a “ride” in the dental chair, and brushing a stuffed animal’s teeth. A Happy Visit will allow your child to become familiar with our office and team. If you are a current patient of our practice, we love to schedule your little ones’ visit when you come to get your teeth cleaned. This way, your child can see how easy it is for you to have your teeth cleaned at our office.